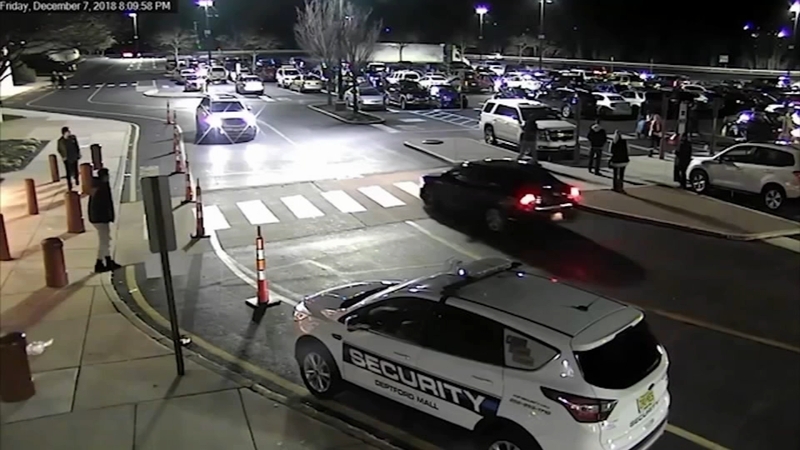 Police have released surveillance video depicting a vicious attack on three teens at the Deptford Mall as reported by Christie Ileto during Action News at 11 on December 11, 2018. DEPTFORD TWP., N.J. (WPVI) -- The Deptford Township Police Department has released surveillance video depicting a vicious attack on three teenagers at the Deptford Mall over the weekend. "Seeing the video is nerve-wracking," said Taylor McFadden, one of the teens involved in the incident. "I've been second guessing myself: did we do something wrong? Did we say something wrong? Did we do something to cause this?" The video shows McFadden and her two friends walking to her car. McFadden's two friends stand near the car to smoke a cigarette while Taylor gets in the car. Minutes later, a white Pontiac drives up, seemingly waiting for the spot. The girls said they waved the car on to let the driver know they were not ready to leave. Cameras then capture four adults, two men and two women, slowly walking past the teens' car. One of the victims, Alexandria DeRusso, is adamant they never said anything to provoke the punches. "They swore we said something about them and just walk back, and you see them hand the bag over to somebody else before they hit me," said DeRusso. The victims also allege that the attackers shouted racist remarks. "Seeing the guys rip me by my hair, as the other woman is hitting me. You can see the size difference and to see that both men are hitting me," said DeRusso. The teens said there was a mall security vehicle nearby, but no one was in it. "We thought somebody was out there. We were screaming the whole time," said McFadden. It's not immediately clear where the mall security guard was at the time of the incident. Police said the attackers fled the scene by car. "Why? Over a parking spot? Was it really that serious? You could have just asked us to move," said DeRusso. Anyone with information on the incident is asked to contact the Deptford Township Police Department.